BUT what happens when we want to help someone change their behavior? I was social worker whose clients were addicts, chronically unemployed, and those who had a hard time seeing life could be different. As long as they couldn’t see their life as any different, there was no reason to change their behavior. They need to understand the effect change will have in their life. They need proof beyond a reasonable doubt change will help them. There was one young lady who I had the pleasure of working with and still keep in touch with today. Let’s call her D. She was a heroin addict who also had an AIDS diagnosis. At our first meeting, I knocked on her front door to find her and her dealer getting high. I opted not to go in and told her I would be back in an hour to talk with her. Of course, an hour later she didn’t answer her door. As someone who was early in their recovery, I knew I couldn’t save her, she would have to save herself. She would have to want to change her behavior. Over the next year, we had many run-ins over her drug use but every step of the way, I was able to show her glimpses into the positive effect not using would have on her life. Would it cure her AIDS? No but it could prolong her life. She could feel better. The medicine wouldn’t make her sick. With each little milestone – a few days clean, not sharing needles to not using needles – we celebrated. With each little milestone, she saw glimpses of how her life could be different. First, the restored relationship with family. Was it easy? No. Did she slip? Yes. Each time she did, she remembered the positive impact the change had on her life. Today, she still continues to fight the AIDS battle (27 years and counting ), has fought cancer and even went back to school to get her GED. She is living a life she couldn’t even imagine 26 years ago. Believe it or not, I use the same social work tactics in my business. From helping team members reach their goal to working with colleagues to help them move forward when they are stuck. Someone has to want to change. We all talk a good game when it comes to making changes BUT are you really willing to reach down to the depths of your soul to make the change? Someone needs to hit rock bottom before they change. I believe each person is different and for some, yes this is VERY true. When you are ready to apply the two elements to the area of your life you want to change, AMAZING things can happen. Want to make a change in your business? Want to make a change in your relationship? All things are possible when you embrace these two elements. Today December 1st is World AIDS Day. For some, it is just another day. For others, it is a time to remember those who have fought the battle and lost, encourage those who continue to fight and educate to end AIDS in our lifetime. Since leaving the field of HIV/AIDS many years ago, I seem to have become complacent about what was a passion. Living with a chronic illness has brought back many memories for me. 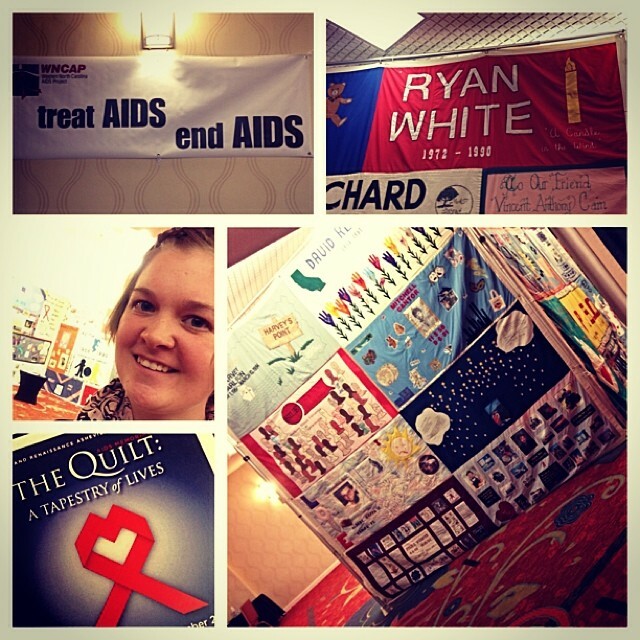 So today, I am reflecting on the lessons I learned when I worked for the South Jersey AIDS Alliance. As a new “inexperienced” Social Worker and a recovering addict, I was the “crazy white lady” who stepped into Bridgeton wanting to help the world. Yes, it is what many of my clients thought of me and willing shared as we got to know each other. I didn’t see any of the people who walked through our doors as “diseased”, “hopeless” or less than. I saw them as people who because of their bad choices were sick. “There by the grace of God go I” was a constant reminder for me since I had made many bad choices over the years. So what could I do in a little office (actually half a duplex) with little funding, the only paid staff, a handful of volunteers (who in many cases were also clients) and a heart wanting to save them all. In those early years, AIDS was not a “manageable disease” for many it was a death sentence. It took babies from their mothers. Moms and dads from their kids. It took people from all walks of life – yet no one talked about it. I can remember the first few funerals where the family said “they died of cancer” because they did not want their loved one to be remembered for the stigma of HIV/AIDS. This was the world I dedicated many years of my professional life too. Belinda grew up joining me in this battle to end the stigma of HIV/AIDS. She played with kids who were HIV-positive, she shared her toys, she helped with fundraising, as well as sorting and delivering holiday toys. She grew up with a passion for helping people which I admire. Globally, there are an estimated 36.7 million people who have the virus. Despite the virus only being identified in 1984, more than 35 million people have died of HIV or AIDS, making it one of the most destructive pandemics in history. Only 1 in 4 people are making their way through the obstacles called health care and medications. Let’s not be complacent. Let’s continue to share how HIV can be transmitted. Let’s all work together for a day when there is an AIDS-Free Generation. World AIDS Day is important because it reminds us and government HIV has not gone away – there is still a vital need to raise money, increase awareness, fight prejudice and improve education. What are you willing to do to help? Today, I remember those who fought a great fight – Jackie Wise, Matt McCrossen, Sam, Maria and all of the others who walked through the doors of my office in Bridgeton and the other SJAA offices. I honor those who continue to fight especially Jeff, Donna and Veronica. They continue to inspire me with their strength and determination after 26 years. Honor someone you know who is living with HIV/AIDS or who has lost the fight. Share their names so we too can honor them. Today, we celebrate #GivingTuesday. Today marks the fifth year of a global day of giving fueled by the power of social media and collaboration. #GivingTuesday is celebrated on the Tuesday following Thanksgiving and the widely recognized shopping events Black Friday and Cyber Monday. I know you are thinking “we give all year long”, right? The truth is many times we plan to give but the moment passes us by – lack of funds, lack of time or just “a senior moment”. #GivingTuesday kicks off the charitable season, when many focus on their holiday and end-of-year giving. As individuals, we have causes near and dear to our hearts. Those who may have helped us personally over the years or maybe made a difference in the life of a family member. Maybe it is just because you can relate to an organization’s mission. South Jersey AIDS Alliance is a caring, compassionate Organization dedicated to the fight against HIV/AIDS. Located in Atlantic, Cape May, Cumberland and Camden Counties , their vision is to be recognized as a dynamic organization able to efficiently and effectively provide the diverse and integrated program delivery needed to meet the challenges of the rapidly changing nature of the worldwide HIV/AIDS epidemic. Bethel AME Church which also houses Bethel Development Corporation and Bethel Learning Center is the oldest church in the City of Millville. It houses the longest running soup kitchen in Cumberland County providing hot home-cooked meals four days per week. The Learning Center is open to children 6 weeks to 5 years of age as well as offering Before and After Care programs. All programs at Bethel are focused on giving a hand up to those who are struggling – the addicted, the chronically unemployed and the homeless. #GiveBackWithMe is my way of bringing a smile to someone who is struggling. Every month, I select one individual who will receive a gift from me along with some encouraging words to let them know they are special and worthy. To remind them, no matter what the struggle there is someone who cares for them. Click HERE and help me to make a difference in the life of someone. Nominations are taken 365 days a year…. one selected each month. This November 29th, join the movement and give – whether it’s some of your time, a donation, gift or the power of your voice in your local community. #RandomActofKindness will #makeadifference in the lives of others. It’s a simple idea. Whether you come together with your family, your community, your company or your organization, find a way to give back and then share your idea. Share with us YOUR favorite cause with a link on how others can donate to them…Have a ThirtyOne-derful day!